The most amazing artifact they had, was a 12 meter long whale skeleton, which is shown on the two pictures below. This particular picture, shows the whale from the back. 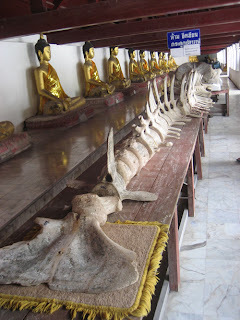 Although there's a sign (in Thai) that clearly states that it's not allowed to write on the bones, the bones are covered from top to toe in graffiti. This is the whale photographed from the front. 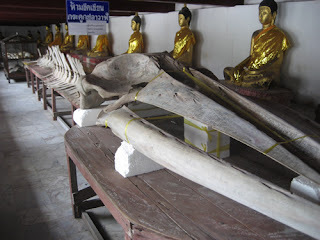 The bones of the head of the whale are at least two meters long, if not more! 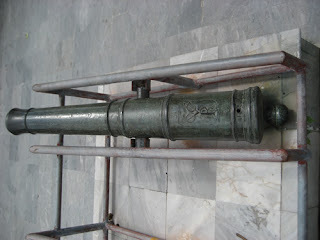 I thought this a pretty astonishing find in a most unexpected place, namely inside the temple grounds of one of Thailand's largest temple complexes. 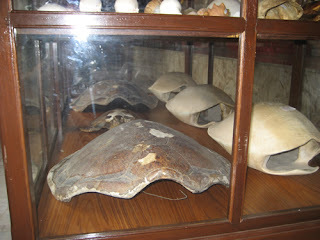 Besides the whale skeleton, there are also these turtle shields, a grand total of 6 massive turtle shields and a smaller turtle, in full original size, above them in the same cabinet, together with dozens of other shells. 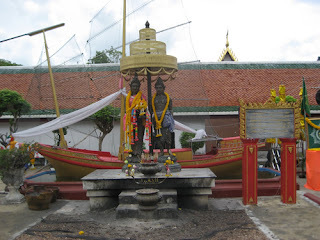 On the same temple ground were also some ocean related artifacts, as you can see in this picture, two bronze statues in front of a boat. Here's another picture of the rather large scale boat in a small pond. 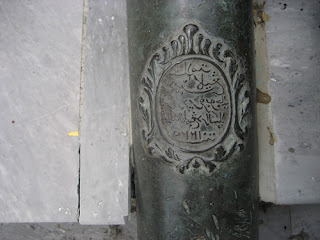 Besides the big surprise of finding a whale skeleton here, there are also some ancient canons on the premises, some of Arabic origin, as shown in this picture. 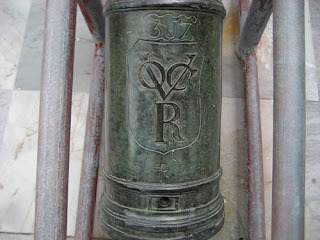 To my big surprise however, there's also a canon of the VOC, a Dutch company formed in 1602. 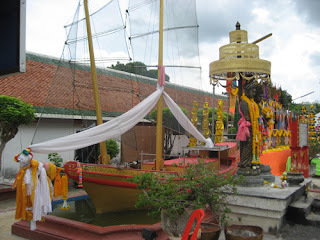 It shows Nakhon Si Thammarat's importance as an ancient city with a rich history due to it's harbor. Thought these unexpected artifacts interesting enough to share with you, although they're only remotely related to diving.